Polyester(faux animal) skins area rug,cowhide rug,brown white faux cowhide area rugs. Material: 100% polyester(coral fabric+Latex backside). Soft Fur：Silky, Super soft,Hair length: 5mm.Backing materias - Latex, non-slip.Sturdy and durable, don't fall off, washable. Scope of application:living room, bedroom, childrens room,bathroom,study,doorway,Wedding,Party,Celebration Or Any Occasion. To prevent injuries to children and the aged at home, supervise your child, be aware of the risks, create a safe environment. Easy to store: soft, can be folded into 35cmx35cm small box stored up. Perfect design: real looking beyond your imagination.This cow print rug will easily incorporate into almost any design scheme, at home or the office. Ample 55" x 62" size is the perfect choice to fill the vacant area of your home. This faux cow rug allows you to unleash your wild side and make your home looking to a new level. Are you still hesitant?Absolutely make your purchase value for money. *Please allow 1-2cm error due to manual measurement and make sure you do not mind before ordering. Size Approx:55x62inches(140cmx160cm) is the perfect choice to fill a nook or protect a walkway. Surface material - 100% polyester,hair length approx 0.25 inch(0.5cm),soft, comfortable, easy to clean and maintain, and durable. Backing materias - Latex, non-slip, better cling to wooden floors, tiled floors. 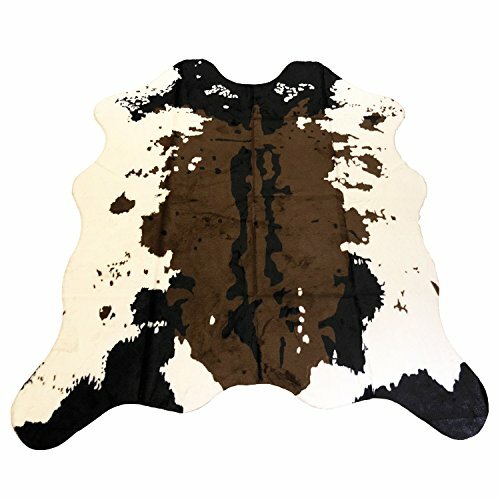 Eco-friendly Faux cowhide rug,cost saving item.It's a great animal-friendly alternative. Brown black cows brindle, white belly cowhide rug, soft color, will make your home's inconspicuous area more visible. If you have any questions about this product by JaYe, contact us by completing and submitting the form below. If you are looking for a specif part number, please include it with your message.